Would you like chickens with that? 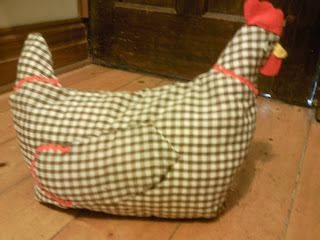 : A big fat hen! Here's a nifty piece of re-purposing. 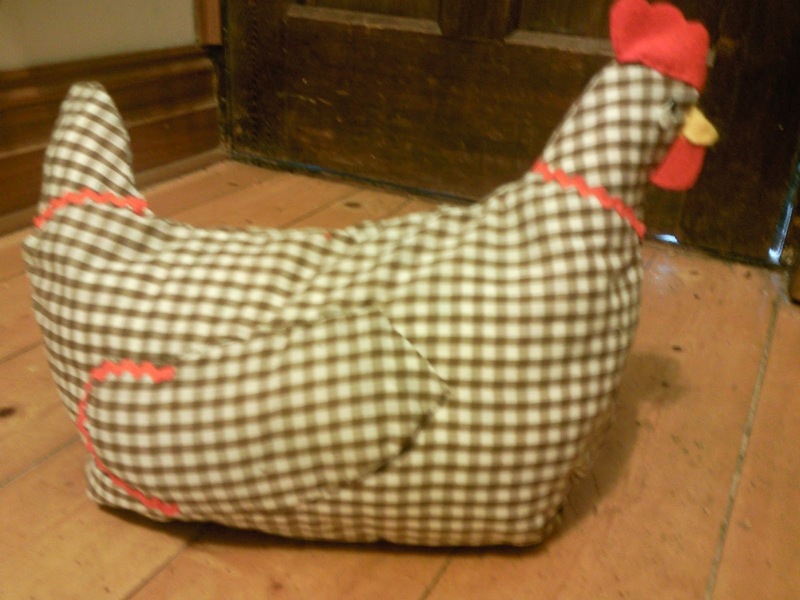 My mum, knowing my love of all things chooky, sent me this large gingham girl already 3/4 made up as a tea cosy - I just needed to hem her. However, circumstances conspired that we had to get a new teapot (DD or DS broke it, can't remember who or how! ), and we now have the the IKEA Anrik 'coffee pot/tea maker'. First world problem: tea cosy to teapot disproportion. Solution: turn tea cosy into doorstop. Method: stuff her with wadding (old cushion inner), put a nice half brick inside (wrapped in some old towelling to protect toes from stubbing), sew her up and away you go.